I received this email from Inbound.org recently. The ‘manage your preferences’ suggests this is a mass email. However it’s short enough, direct enough, and specific enough to motivate replies. These messages prime people with negative views of the group. They remind people they decided not to participate. The best way to re-engage someone is simply to pretend they never left. I like this too - I’m just starting to think of ways to re-engage members. I guess not all members actually “leave” - there’s much about how sometimes we get bogged down in our daily lives that it becomes less of a priority to log in to communities and engage - we’re all probably prone to this with communities that we’re members of rather than managers of. A gentle reminder like this can help pull people back in who have simply got out of the habit. Think Ill look at something like this. I would recommend it. I do it and it works incredibly well. My emails are manual rather than automated, but take a similar format. I use the tagging system I outlined here. 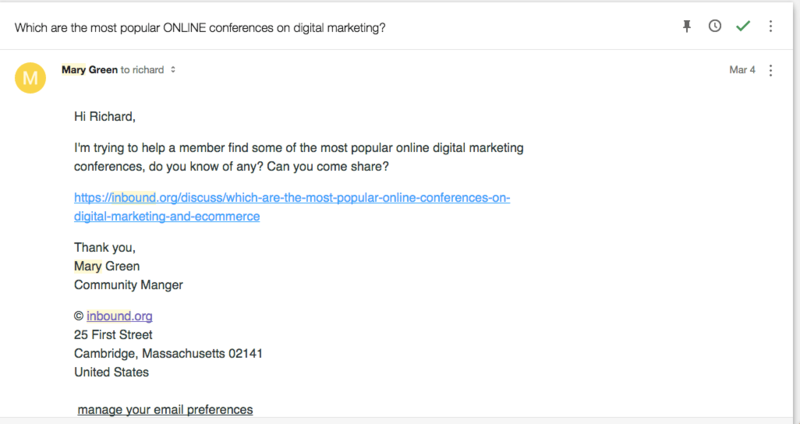 We’re trying to help a member with a sticky marketing question. Given your experience, I’d really value your thoughts – are you able to help? Hold onto this email until you have 5 minutes to spare and then share your thoughts/advice about thin content here. You’d really be helping us all to learn! The subject line is pretty important though, I think. I’m working on a few different variations. For proof of efficacy, just look at the epic posts that Joe made in that thread! Current favourites are “An email from a real person!” and “I could use your advice on something”. I think that anything personally crafted is the most effective, and a PM notification still comes from the system, which might take the edge of that advantage. It would be difficult to test. @HAWK’s personal emails can load a lot more context, and a more intimate relationship. There’s a time and place we do that sort of thing too, but the vast majority of our outreach now is to groups of people by segments. There’s a bunch of ways we run this kind of segmentation. Job titles, skills in their profile, pages viewed, people you follow etc. and then suppressing (or further personalising the message) by things like timezone, email throttles (so we don’t bombard you), contributor level and so on. What we’ve found is making something more specific (but without actually giving the game away - hold some curiosity) we get ever better results. This is what’s led us to (almost) double the number of unique weekly contributors in the community. That is phenomenal. Awesome result. Thanks for your input and subject line suggestions. I think the key here is having the ability to do that segmentation within your platform. Yours is bespoke right @edfryed? I’ve explained how I tag users with Discourse in this topic, but I’d be really keen to hear from others on different platforms that have had some success in this area. As per the other discussion, this is definitely something that could be a more modern part of a community professional’s role. Taking interesting discussions and using tagging to send out a broader, relevant, message to a segmented group. Really love what inbound did here.